1/8 H.P. w/switch and regulator. Economical and suitable for all airbrushes. It is capable of delivering 20-40 P.S.I. depending on airbrush being used. 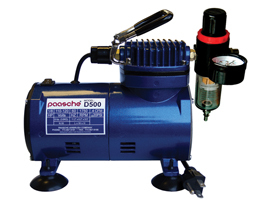 The Paasche D500SR is an oilless piston compressor.